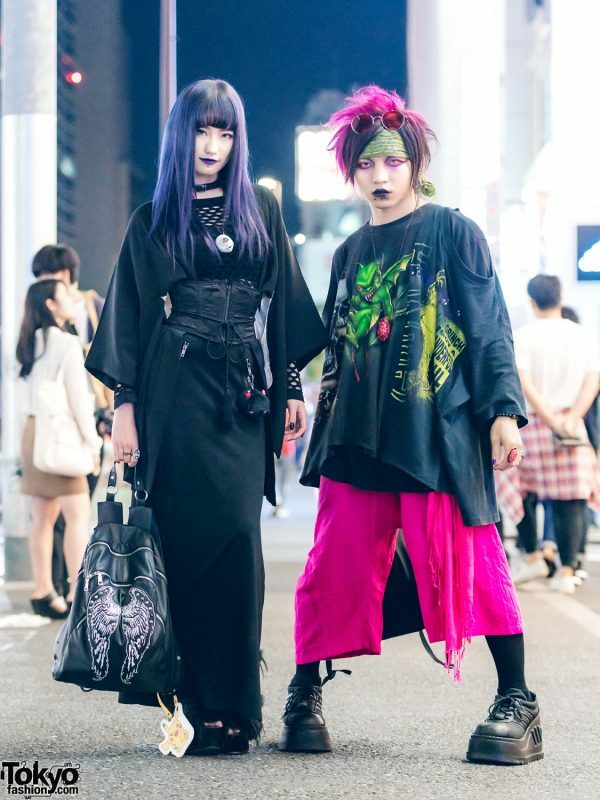 While walking around the Harajuku neighborhood one night, we came across Karen and Barokue, who captured our attention with their striking hair colors and dark streetwear looks. 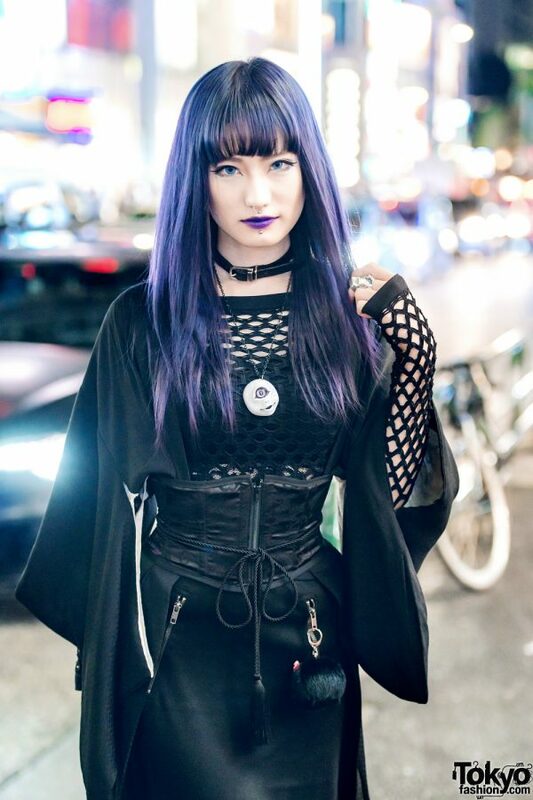 Purple-haired Karen – a 23-year-old who works in the hospitality industry – is sporting a sleek black outfit, consisting of a two-tone kimono sleeve coat over a long sleeve cutout top and black bralette, all of which she bought in Harajuku. She paired her layered tops with a maxi skirt with zipper front pockets from H&M, platform fuzzy ankle strap sandals from Jeffrey Campbell, and she is carrying a black winged backpack with spike embellishments from Glad News. Her accessories include silver hoop earrings for her gauged ears, a silver nose ring and labret piercing, a leather belt choker layered with a silver cyclop pendant necklace from A.K. 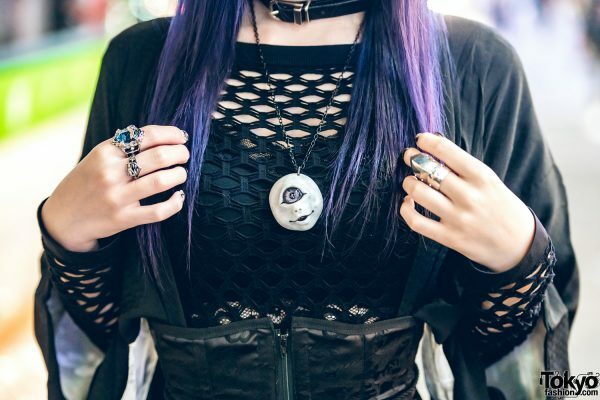 Production, a Vivienne Westwood armor ring, a gemstone and shield knuckle rings, a zippered lace corset layered with a tassel rope belt, and a black stuffed animal keychain from Shibakoro. 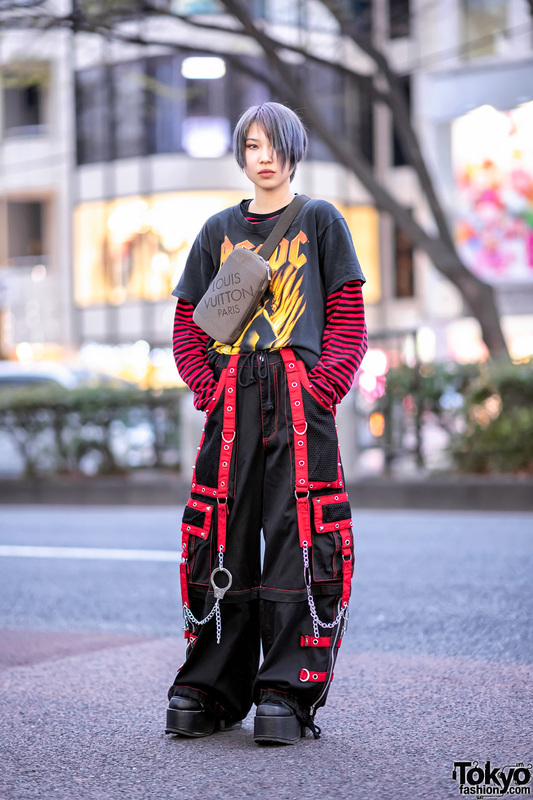 Karen’s favorite fashion brands are Killstar and Vivienne Westwood, and she likes the music of Lynch and D’espairsRay. Karen is active on Twitter and Instagram. 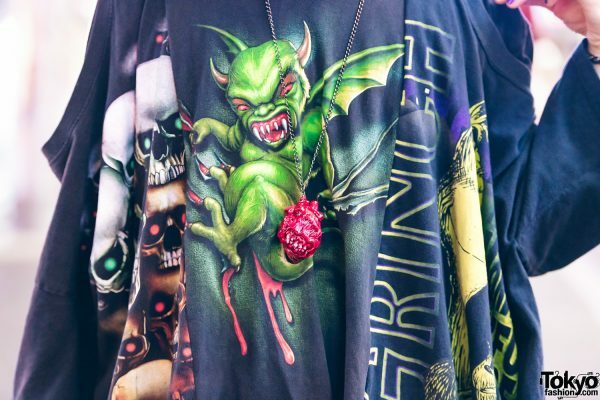 Meanwhile, Barokue – sporting two-tone hair, black lipstick, mismatched colored contacts and dark eye makeup – is dressed in a black layered long sleeve remake shirt with cut out shoulder details and skull, devil and grinch prints. 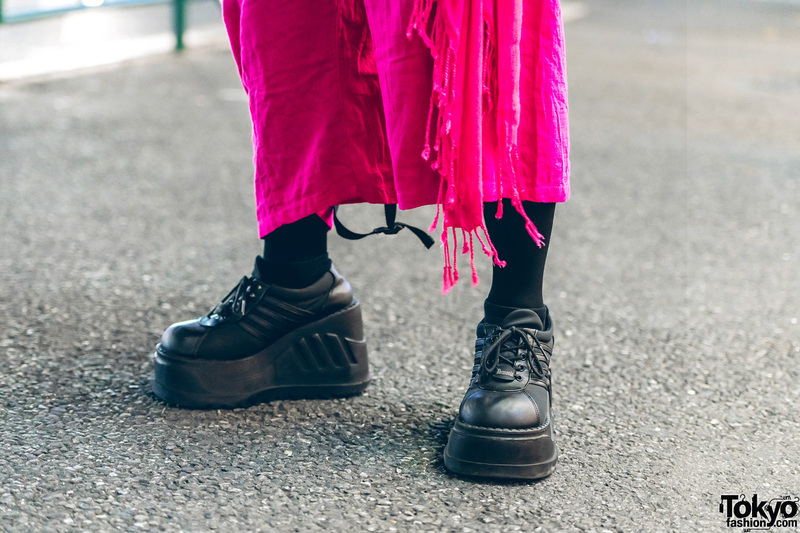 He paired his remake top with pink 3/4 loose pants with a fringed panel, long black socks, and platform lace up shoes from Demonia. 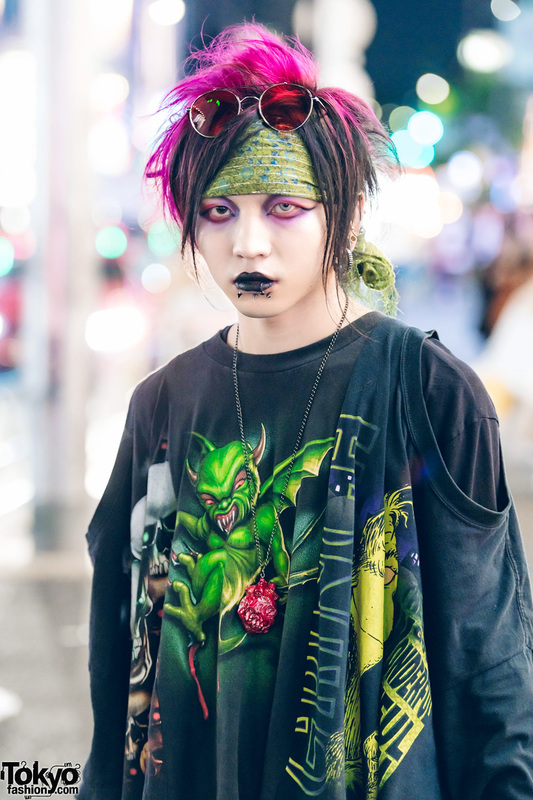 He capped off his statement-making look with accessories – some of which are handmade – such as a green floral print headscarf, red-tinted sunglasses, ear cuffs, hoop earrings, gauged earring, a lip ring, spike labret piercings, an anatomically correct heart pendant necklace, stacked bracelets and multiple knuckle rings, and a brain cocktail ring. 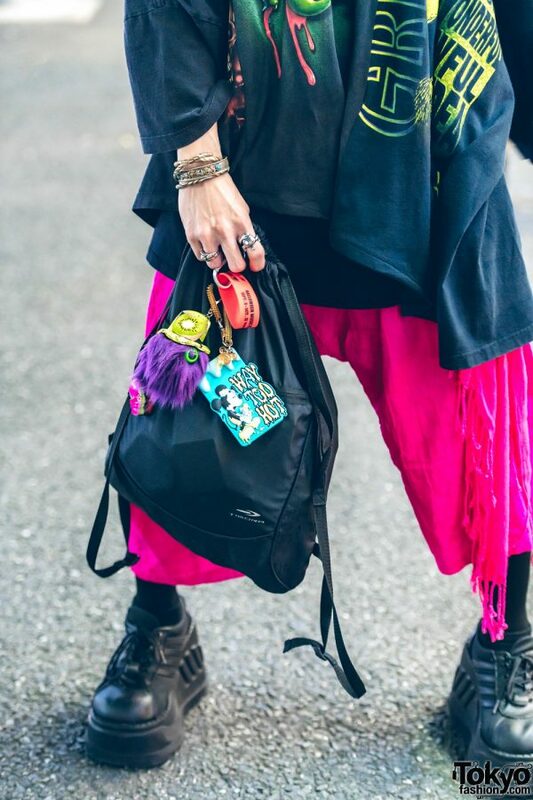 He is carrying a black drawstring backpack with colorful keychains. Barokue told us that his favorite fashion brand is M:E. Follow him on Twitter and Instagram.